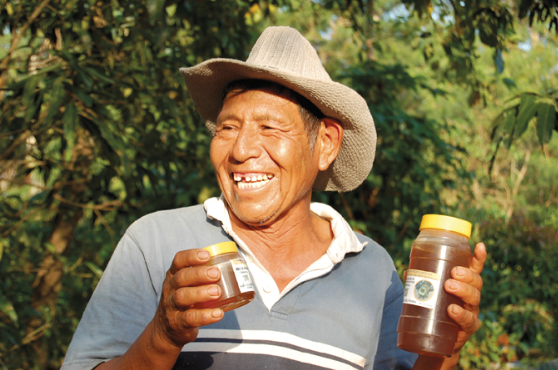 From page 2 of this 'Inside Story': Carlos Calani, honey producer and Watershared participant. Reciprocal watershed agreements – otherwise known as Watershared agreements – are simple, grassroots versions of incentive-based conservation that help upper watershed forest and land managers to sustainably manage their forest and water resources to benefit both themselves and downstream water users. Watershared agreements focus on changing behaviour through economic and non-economic incentives and building institutional capacity: in other words, on showing local authorities and water users that watershed protection is in their own interests, and then on helping to create the institutional framework needed to plan and implement it. The Watershared model was first developed in 2003, in the Bolivian village of Los Negros. Six downstream irrigators negotiated a ground-breaking deal with their upstream counterparts. “For every 10 hectares [ha] of forest you conserve for a year,” Andrés Rojas told Serafin Carrasco, “we will give you a beehive and training in how to produce honey.” And so the first reciprocal watershed agreement was struck. By 2016, an initial six farmers protecting 465 ha had increased to 4,500 families conserving 210,000 ha. *download from the right-hand column or via the link provided under further resources. The Key Messages are provided below - see the full text for much more detail on the implementation and sucesses of Watershared agreements and their role in climate compatible development. Watershared agreements, which provide alternative development tools such as beehives, fruit tree seedlings and irrigation systems to upstream landowners, are a quick and low-cost route to forest conservation in upland watersheds. The agreements rely on local negotiations and consensus, avoiding the red tape associated with nationally funded conservation-incentive schemes. Watershared agreements can address multiple objectives, for example economic development as well as forest conservation and climate change mitigation and adaptation. The agreements allow for the participation of poor people because formal land titles are not a requirement, and bureaucracy is low. Their flexibility means that participants can design and implement them to suit local needs rather than to comply with national policies and laws. Households and private sector enterprises, such as water user associations, irrigators and cattle ranchers, contribute to financing the programmes. Public-awareness campaigns can play an important part in securing the changes in behaviour and practices that are needed to make agreements work. One benefit of the agreements is that they have been proven to play a role in reducing local conflicts. From page 7 of this 'Inside Story: Watershared agreements allow upstream landowners to protect the water sources upon which downstream users depend. This Inside Story was written by Nigel Asquith from Fundación Natura Bolivia. Asquith, N. (2016) ‘Watershared’ – Adaptation, mitigation, watershed protection and economic development in Latin America. INSIDE STORIES on climate compatible development. Climate & Development Knowledge Network: London, UK.